Philip Conway, Deputy Prime Minister and Leader of the House is attending a party conference. But, tipped to be the new party leader, his campaign for power is in serious danger of collapse. Visits from rivals, fellow conspirators and the all-too-attentive Vicky coincide keeping Philip on his toes; the world’s press is in the lobby; there are threats of assassination; students are rioting outside the hotel: an uncomfortable evening is the result! Who will get his – or her – just deserts? DAVID Beddy is a highly accomplished actor whose equally at home with both serious and comedic roles, and his portrayal of ambitious politician Philip Conway is a delight from start to finish. Pip as he’s more affectionately known, has one eye on the to job. But he lacks the sort of ruthlessness that keeps the character eminently likeable in Eric Chappell’s briliantly observed political comedy/farce. You get the distinct impression Pip’s plans could unravel at any moment, which makes it impossible not to warm to an MP who is anything but a natural born orator. Give Beddy the chance to work alongside Martin Oldfield as Pip’s personal bodyguard Higgs, a fully paid up member of the call it as he sees it brigade and Joanne Buxton as the seductive Vicky and you have the recipe for pure comedy gold. When it comes to Oldfield I firmly believe he doesn’t have a bad performance in him and Joanne Buxton as Vicky expertly assumes a variety of different personas as she sweeps into Pip’s hotel room. Who can forget Mark Edgar-Clarkson as Lionel Berryman MP, a serial lush with a very dubious sense of morality. Like me you probably know Eric Chappell more for his brilliant 70’s sitcom Rising Damp featuring that giant of British comedy, Leonard Rossitter. But Mark Jephcott’s perfectly paced production has certainly whetted my appetite when it comes to seeing more of his plays. Great fun – just what we need on these freezing late winter nights. BEDROOM farces often have more spice when there?s a political element to them. 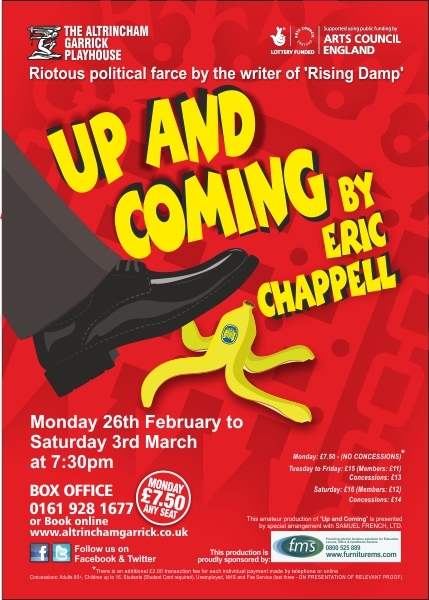 An example is Eric Chappell?s somewhat wordy comedy, Up and Coming, Altrincham Garrick Playhouse?s current production. It concerns the struggles of Deputy Prime Minister Pip Conway, an alcoholic with an eye on becoming PM. His weak spot is women. In that role, David Beddy is pursued by two ? former lover, Vicky and secretary, Lorna Fiske. Pip is, of course, married and such dalliances go against the grain for a man with political ambition. David?s face reflects all. Joanne Buxton?s Vicky oozes sexiness as she lays not just herself but her motives bare. Rachel Perrin?s Lorna is also besotted by Pip but her approach is totally different. One of the funniest scenes is when both ladies end up in bed, not with Pip but with the one-eyed Lionel Berryman, MP (charismatic Mark Edgar-Clarkson) causing the ever so Prime Ministeral David Reynolds with his sarcastic wit, to complain that the chandelier in his room below is rattling! It?s lovely to see Garrick stalwarts such as Martin Oldfield as the amusing special branch officer, Higgs, and David Reynolds as the Rt Hon. John Henderson, MP, strutting the boards again so professionally along with newly returned Matthew Foster as the Rt Hon. George Reynolds MP. Thanks to the set designers ? Trevor McKie, Paula Keen and Mark Jephcott and their team ? the two roomed set has doors, through which the cast can appear and disappear or, where necessary, hide in their conference hotel. Local AV equipment hire firm Keyteq answered the call from the Altrincham Garrick Playhouse recently who needed a powerful projector to deliver their staging plans for their production of the political comedy farce ?Up & Coming? written by ?Rising Damp? author Eric Chappell. The play which opened this week and runs until Saturday 3rd March is set in a seaside location. The play?s director Mark Jephcott explains, ? ?We like to surprise and entertain our audiences here at the Garrick with great set design and for this production of ?Up & Coming? we wanted to bring an idea of the plays location to life. To do this we needed to project giant images behind the main set construction which required an especially powerful projector. Thankfully, Keyteq were able to provide one at a budget we could afford and the result is spectacular. I?m sure that our audiences will love it.?? The play is a clever combination of a ?Yes Minister? style of comedy ? a smash TV hit at the time the play was written in 1989- and fast paced political farce. Philip Conway, Deputy Prime Minister and leader of the house is attending a party conference. Tipped to be the new party leader, his campaign for power is in danger of collapse. Visits from rivals, fellow conspirators and the all-too-attentive Vicky keep Philip on his toes. What?s more, the world?s press is in the lobby, there are threats of assassination and students are rioting outside the hotel. Jo Johnson, a Director at Keyteq Altrincham said, ?We are delighted to help out our local theatre. Over the years we have built our business on providing a wide range of event services to suit all budgets and we think the Garrick?s set design concept which now incorporates the use of one of our projectors is fantastic.? This amateur production of ?Up and Coming? is presented by special arrangement with SAMUEL FRENCH LTD.